Tubular muscular organ, conical at its opening at the dorsal mantle cavity; the octopus discharges water through it to move quickly and to oxygenate itself. 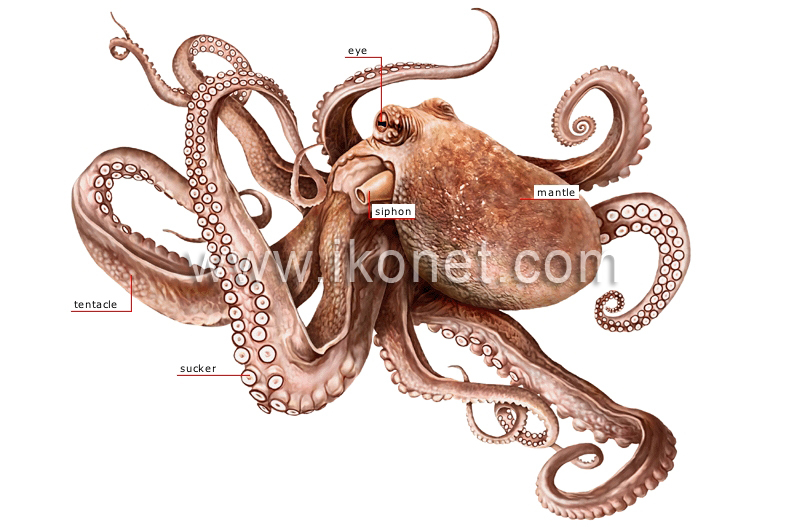 Thick fold of tissue enveloping the body of the octopus and secreting the shell, which is hidden inside. Developed organ of sight used to make out light intensity, motion, shapes and certain colors. Long powerful muscular appendage located around the mouth and used for locomotion and grasping. Adhesive disk surrounded by a flexible ring located on the ventral surface of the tentacle and used for suction and anchoring.